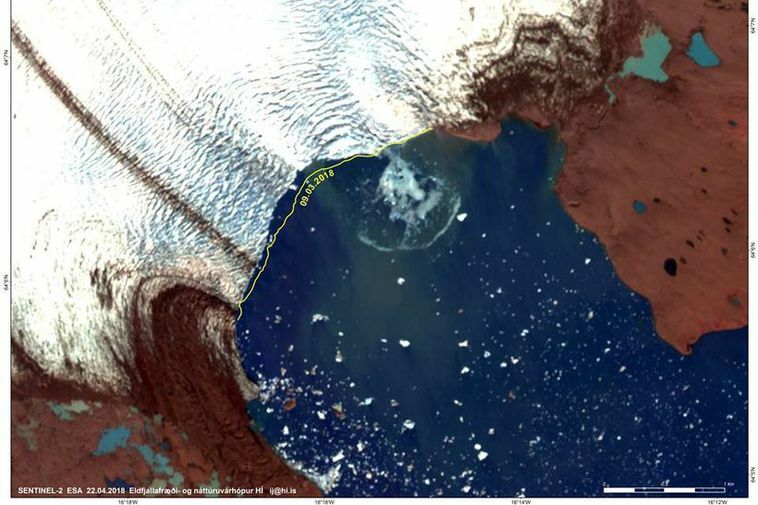 Ice has calved in Breiðamerkurjökull glacier forming a large iceberg turning round and round in the lagoon and pushing a wave of water ahead of it. Recently, satellite pictures were posted on the Facebook page of a geology and natural hazard group at the University of Iceland on the changes that have occurred from March 9th to April 22nd. Calving is when icebergs break from glaciers and fall into lagoons. The white semicircle seen on the image is sometimes known as an "iceberg-tsunami."